She's Fantastic: Women of Halloween Part 6 - HEXADECIMAL! I think the figure is great. Yes, her frame is a little blocky, but that's the way she looked in the show. My only complaints are that she is made from a very soft rubbery plastic. She stands okay on the figure stand she came with, but her legs and ankles are way too weak to support her long-term. She'll definitely need a doll stand to hold her at the waist. Also, I'm not a big fan of how far her masks stick out when viewed in profile. 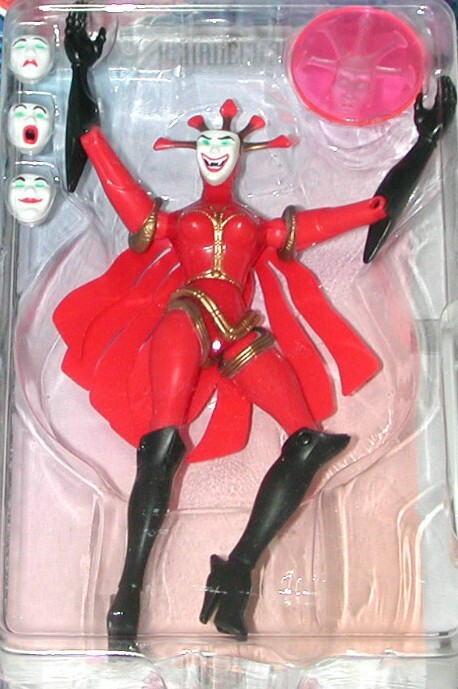 It's not a big gripe, but I wish the masks were thinner or that her face was sculpted to accommodate them better. Hexadecimal came in two additional styles. The first is very similar to mine, but with a slight redeco..most noticeable is that her cape is red instead of maroon. The second is a rare all-black version which is apparently how she appeared in the final season of ReBoot.